Soulful Living=Goals with Soul - featuring The Desire Map is a program for clarifying what you truly want in every area of your life, and using that powerful awareness to guide your choices from now on. We will create sacred space, backed by a great music playlist and tied together with shared intentions. This page has everything you need to know about preparing for the workshop. 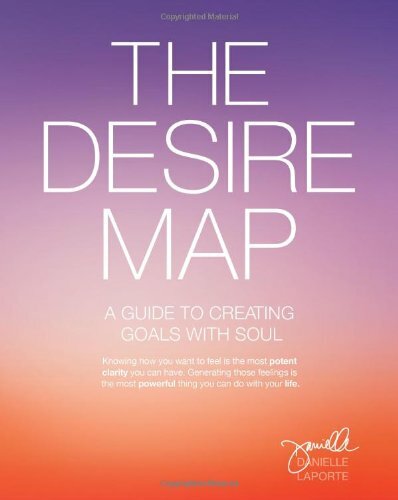 First of all you need to get a Desire Map book. There are a number of places you can get it. I often buy them on Amazon.ca. To the right is a link to my affiliate link if you choose to buy it there. If you have Prime, you'll get it in 2 days. You can certainly buy it at your local bookstore as well. I also have an affiliate link to the shop on DanielleLaporte.com. You can find some very cool Desire Map products that you can't find anywhere else. The prices are in US dollars though, so be aware of that. You might also want to buy her book called The Fire Starter Sessions. It's a fantastic book! Right now you can access her audio course for free! If you decide to sign up. I highly recommend listening to the first few before we gather. They are about 20 minutes each. So inspiring! A great warm-up for you! Your Desire Map book. I usually recommend writing in it since it's a book and workbook in one. However you might want to keep it clean. An option is using a notebook for everything, or you can purchase a workbook here–although it's not necessary. A notebook for notes, setting intentions and making plans. A pen, pencil or coloured pens. Some people like having highlighters. I love gold and metallic pens. Bring what makes you happy! This is all about feeling GOOD! Some art supplies. We will be doing a little art project. You can bring magazines, scissors, fun paper, glue, stickers, paint, brushes, markers, or whatever you have. I will bring some little 8x10 canvases for everyone. Even though this sounds a little strange...please bring a candle. Wear comfortable clothes. Take care to pick something that you feel good in and it makes you feel happy when you wear it. Bring a water bottle, coffee and snacks. I'm not sure what's happening with the meal. I suggest checking with your host. You may bring your own meal, or something to share–potluck style. We may be doing yoga. Bring a yoga mat if you have one. Bring a pillow or anything you need to make you feel comfortable. We will be creating a community of intention for the workshop. We want to start the day with each of us sharing something that is a celebration of what is sacred to us. Please think of something you can bring that is sacred/special to you. It can be an object, a piece of writing or a picture. Anything you want. In order to feel prepared before we gather, I suggest you set some time aside to dig into the material. The chapter I want you to focus on is the called "Gratitude and Dissatisfaction." 1. Please read the above chapter: Pages 169–170 in The Desire Map book. 2. Please work through answering the questions on pages 171–181. 3. Danielle mentions Shawn Achor in the book. I haven't had a chance to read his book "The Happiness Project," but I have watched his Ted Talk. It’s excellent, and pretty funny! I highly recommend watching it before the workshop if you have time. This is me...Jenn. My core desired feelings are Joy (especially the playful part of joy), Grace, Abundance, Aligned, Golden & Connection. I can't wait to learn what yours are! I'm really looking forward to spending the day with you. I always find these days super profound and I walk away learning new things every time. Until then sending you love and light! If you need to contact me, please feel free to email me here. To learn a little bit about me, click this link for my About Page.